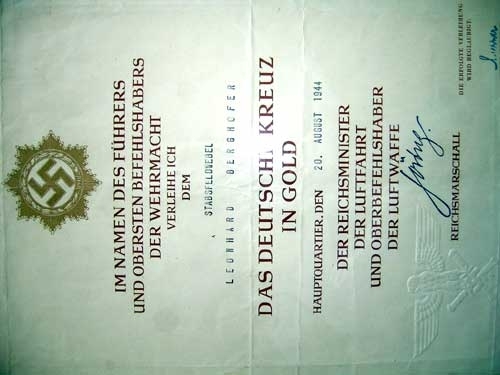 Document lot to a German Cross in Gold Winner Feldwebel Leonhard Berghofer. 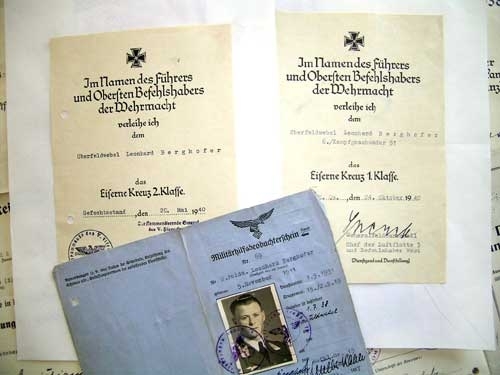 He was Air gunner in KG 51, flying on Ju88 and in 1943 Night Fighter. 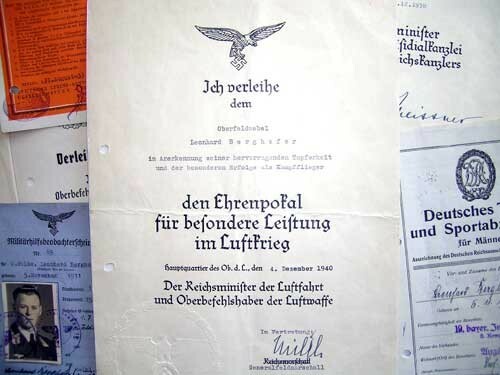 Lot includes these original award documents: Long Service 4th. Class, in 1936; Air Gunner?s Badge in 1935, signed Stumpf; Medal 13.3.1938; Medal 1.10.38 with "Prague" clasp; Iron Cross 2Nd. Class, in 1939, signed v. Greim; Iron Cross 1St. Class, in 1940, signed Sperrle; Honor Goblet as a Kampfflieger, early in December 1940, signed Milch; Telegram for the Goblet, by Sperrle; Squadron Clasp for Kampfflieger in Bronze, in 19141; Squadron Clasp for Kampfflieger in Silver, in 19141; Squadron Clasp for Kampfflieger in Gold, in 19141; Eastmedal in 1942; Krimschild in 1943; Romanian Medal crusade against communism in 1943; German Cross in Gold in August 1944 (slightly cut). Lot also includes Two "Flugbucher" from 1934 to 9.9.1943. With 118 enemy sorties, including 40 early flights against England in 1940. Good "Flugbooks" with many entries. 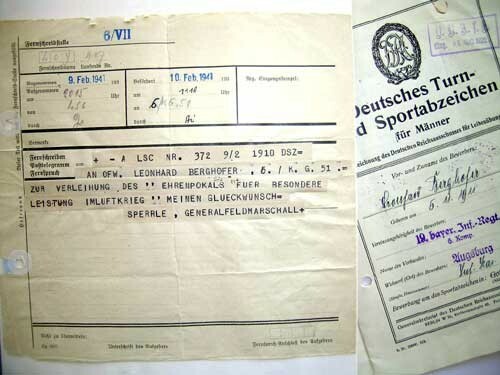 Lot also includes minor documents, like Award document for Sport Badge (with photo), D.L.R.G. Document (with photo), and a pass with photo in Luftwaffe uniform. 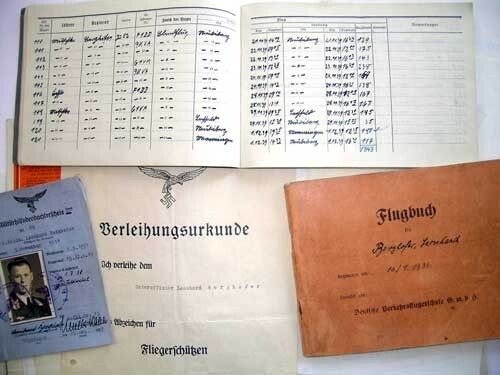 Some documents partly on paper backing, some folded, in generally very good to fine condition. 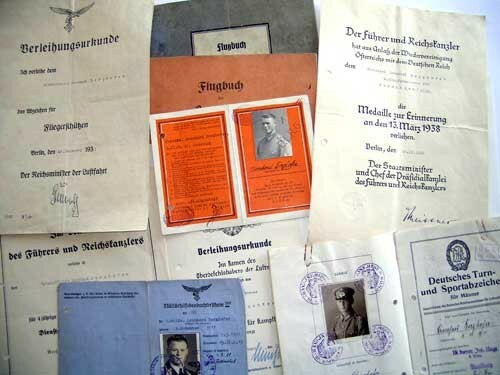 Very large grouping of award documents to an early period Air Gunner.